The shutdown of the U.S. Federal Government has now lasted for over a month, making it the longest political and economic impasse in U.S. history. This is but one sign of our trajectory toward political dysfunction, and schools across the country, especially schools like Catlin Gabel, should take it as a call to action to deepen our efforts to educate students for democracy. Participating in democracy is more than simply having and sharing opinions. When democracy works, it requires that we think outside of ourselves, consider the impact of decisions on the larger community, and think through consequences beyond those immediately apparent. 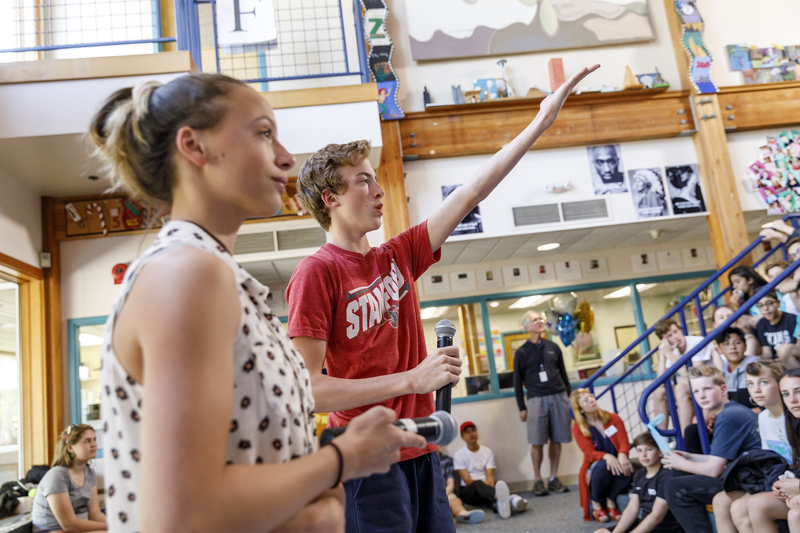 At Catlin Gabel Middle School, we see it as our responsibility to teach and provide opportunities for students to develop the skills that make this sort of democratic thinking possible. These include communication, listening, respectful discourse, empathy, awareness of other stakeholders' needs and interests, self-awareness of biases, and self-confidence as agents for change. Informed and empowered by these habits of democracy, our students can better engage in collective problem solving in order to maximize positive impact. Catlin Gabel Middle School does much of this already. We work hard to invite students' contributions in our classes and in our community. One of my first and most impressive Catlin Gabel experiences was my particularly challenging interview with a student panel in Graceland. More recently, I've seen social studies students drafting class constitutions, and I've coached teachers seeking to step back, decenter their role, and make more space for kids to take the lead and make decisions. Outside of class, we take the time to invite our students to speak up and speak out. Last week we screened a brilliant video on sexual assault made by one of our 8th graders, followed by discussions in grade-level groups. Everyday we see examples like these of our students building their instinct for contributing their voice with optimistic confidence. Of course, our students are not the first to complain about too much homework. And teachers have good reasons for asking students to stretch their capacity and practice outside of school even though these intentions may not be obvious to students when they feel overwhelmed. However, if our homework is as helpful as we think it is, we want students to understand why. And, if it is not, we should take the time to learn from them about how we can do better. To this end, I intend to gather a small group of students and faculty to look closely into this topic and engage in democratic problem solving together throughout the spring. This work will be challenging and time consuming, and it will take some intentional scaffolding to help students ask the right questions, consider the right variables, and generate support for their ideas. However, I think it will be well worth the effort, not just because we have the opportunity to develop practices that students buy into, but also because it gives us an opportunity to teach for democracy while practicing democratic skills side by side with our students. To truly teach the whole child and put students at the center of our work, we will take this time to elicit and listen to their ideas. We are committed to educating for democracy, to inviting and making space for conversations with our students to help them learn and practice how to use their voice effectively and for maximum impact. I look forward to engaging you, your kids, and our faculty and staff in this rewarding work. Pictured: At a community meeting in the Middle School Commons, students lead the discussion and encourage input from their peers.